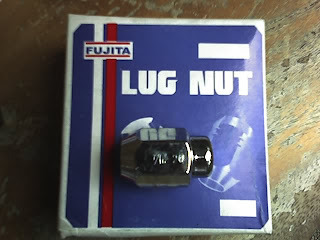 At last I was able to find the correct size of lug nuts for the Fairlady. The size is 7/16ths x 20, which is quite hard to hand here in the Philippines, since we use the metric scale instead of inches. Each nut costs P25 for a total of P400 for the 16 pieces. I bought them at Bigway Hardware store along Aurora Blvd. in Cubao. Not bad at all for the price! 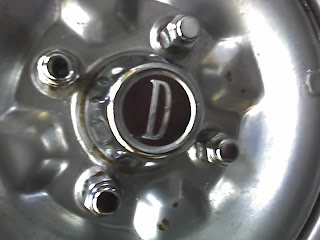 I installed the new lug nuts myself, which was really good exercise especially on a hot day! But it was worth it! The wheel looks much better with the chrome lug nuts and also the threads are protected by the closed design from water and dirt. Now all I need to do is have all the steel wheels chromed!